About 1,000 students participated in the ninth annual Maine Learning Technology Initiative Student Conference at the University of Maine in Orono. When former Gov. Angus King began an effort to give every seventh- and eighth-grader a laptop in 2001, one of the goals was equity, a way to ensure students have access to the same kind of technology whether they live in Cumberland, Washington or Oxford county. Fifteen years later, the program still gets computers to those students. However, geography and school funding have made using that technology a lot more difficult for many rural schools. Joshua Willey was having a frustrating morning. Inside a classroom in Portland’s King Middle School, he glued together a few dowels and pieces of cardboard to build a miniature wind turbine. But when he tested it out, it snapped. After a few attempts, Joshua fixed the prototype. But simply building this turbine was only one part of the lesson. Teacher Gus Goodwin pointed to one student measuring an electric current. Others were designing turbine blades on a computer and producing podcasts about their projects with headphones and a mic. He said technology takes this learning to a different level. When supporters talk about the power of technology in education, this is the kind of project they mean. Teachers at King said they’re able to provide it to their district, where more than half of the student population qualifies for free or reduced-price lunch, because they’re constantly collaborating and sharing digital tools. Research shows doing that in a rural, isolated school is a lot harder, though. About 300 miles north, at Caribou High School, English teacher Shannon Sleeper stood at the front of her class and asked them questions. Her students answered aloud, but many are were busy typing responses in a fully online classroom she created. This is the first year Sleeper has been able to use this technology. More than half of the high schools across Maine have paid for laptops or tablets for their students through the Maine Learning Technology Initiative since 2009. But Caribou never had the resources until this school year, when it bought Chromebooks for every high schooler. Principal Travis Barnes said giving every student a device, instead of forcing them to share them, was necessary. In just one year with the new devices, the high school has already made progress in classrooms like this one. Superintendent Tim Doak said he’s proud of the changes but also is frustrated that many rural schools often lack the resources to integrate technology earlier, an obstacle that can set them behind. “Not to pick at our partners in the southern part of the state, but if you’re not living on the Interstate 95 corridor, you do lack resources,” Doak said. “I think it is a real issue for our smaller and particularly more rural schools,” Amy Johnson, co-director of the Maine Education Policy Research Institute, said. Johnson said this is a problem for rural schools statewide. A piece of the reason, she said, is how new ideas spread. She said technological change often originates with one or two teachers who then spread their knowledge across a building. But in an isolated school, that’s more difficult, she said. Teachers are already stretched thin. Then there’s the question of resources. School budgets are already tight in many districts. Mike Muir, the former director of MLTI, said when a school has to choose between laying off teachers or cutting a foreign language program, it’s nearly impossible to focus on adding digital tools or more tech staff. Add it all up, and that’s made a big difference. Researcher Bernadette Doykos surveyed Maine’s schools and found that even though every district receives devices, the way they’re used tends to be different in high-income and low-income areas. The state found a partial solution to this back in the early days of the laptop initiative. Bette Manchester, the first director of the program, said every middle school designated a “teacher leader” who would connect with other teacher leaders around the state. The group would sort out problems and find new resources they could bring back to share with other teachers. “We found having the statewide teacher leaders — and they were only paid $1,000 a year, and they did enormous work — really helped to kind of even out what’s going on and what are the needs,” Manchester said. The program still exists. But those stipends to teachers were cut, and Johnson said the program was downgraded before being recently revived. “And when those teacher lead roles kind of went away, that community also fractured a little bit,” Johnson said. Despite the challenges, many rural schools say having access to technology does make a difference. Caribou High School student Calvin Mochler said without his Chromebook, he couldn’t have handled more difficult classes that require technology every day. 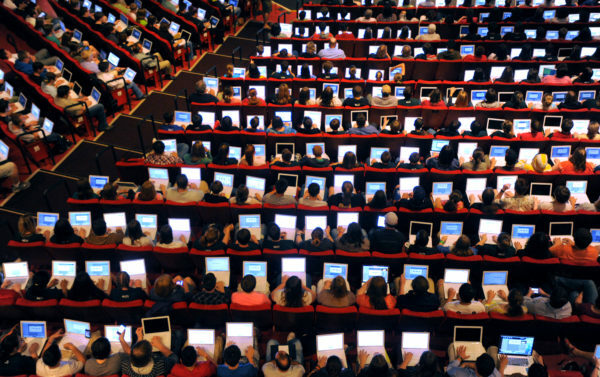 School officials hope students will soon be able to take more college classes online. On the surface that may not seem like a big goal, but they say it’s one way technology can make a difference in the lives of young people in rural parts of Maine. Maine Public education reporting is supported by a grant from the Nellie Mae Education Foundation.